The propeller is new and there is a second new propeller replacement. There are 8 batteries : 2 for stern thruster ; 2 for bow trhuster ; 1 for engine and 3 for domestic. The hull thickness is 6 mm. The floors are in teak wood. 3 cabins, with double berth (aft cabin : 195 x 145 cm ,cabin headroom 197 cm ; lateral cabin : 140 x 200 cm, cabin headroom 194 cm ; master suite : 200 x 160 cm, cabin headroom 193 cm), offer good dimensions to live. Saloon table is transformed in a double berth (110 x 180 cm). In total, there are 4 double berths. The warm air heating unit is a WEBASTO. Cooker is with 3 burners. Under cooker, there is a washing machine, Aquamatic Tempo. The upholstery is in tissue. Boat equiped with a bow thruster and a stern thruster. 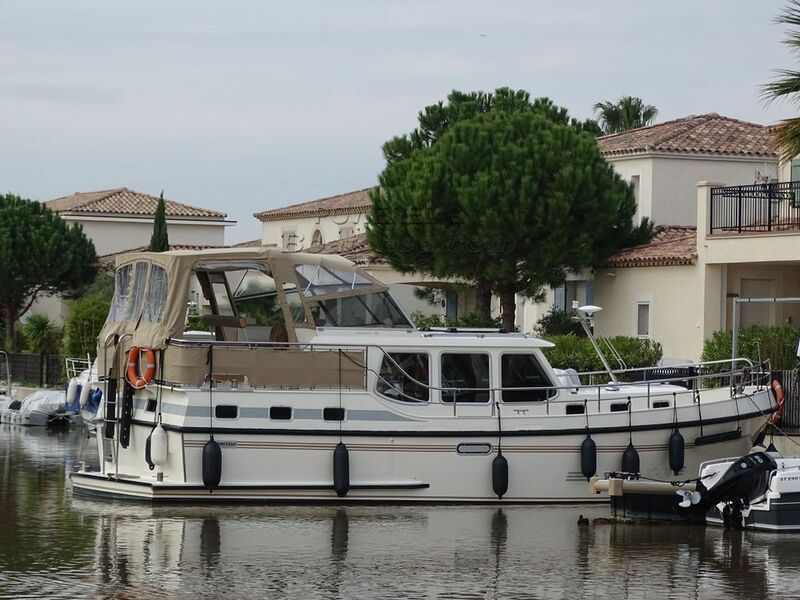 Boatshed Midi Canals is pleased to present you this well loved & professionally maintained PEDRO LEVANTO 38. Built in 2010, I was impressed by the standard of care and maintenance lavished on it by our vendors. This boat is also remarkable for its white colour which gives it a different look from other PEDRO. Well suited to coastal & river navigations in the right conditions this Dutch steel cruiser is equally at home on the Freycinet canals with its air draft variable from 3,70 meters to 3,30 meters. With large windows and good headroom this Dutch steel cruiser offers a pleasant bright & airy interior. Our vendor indicates a fuel burn of 3 litres / hour at cruise speed (5 knots)! The heating unit is a central heating and a WEBASTO. The present owner is just the second owner of this PEDRO LEVANTO 38. Our vendor indicates a river licence cost of about 400 euros per year. In Fluvial magazine 2018, the value is quoted as 249'000 euros. It is the ideal boat for family cruises or with friends. For more information or to organise a visit, please contact, Frederique VALLON, your local broker at Boatshed Midi Canals. This Pedro LEVANTO 38 Dutch Steel Cruiser has been personally photographed and viewed by Virginie et Frédérique VALLON of Boatshed Midi Canals. Click here for contact details.